On Monday evening I went to see the much anticipated documentary film, Patterns of Evidence: Exodus by filmmaker Tim Mahoney and Thinking Man Films. Overall, I very much liked the film and my impression is that it was very well produced and thought out. In short, it was a very high quality production and has great potential to be effective for those on the fence about the historical account of the Exodus in the Bible. I offer the following thoughts to those who watched it on the night of its release, and for those who plan to watch it in the future, perhaps on the History Channel or on DVD. First I would like to state what I liked about the film and offer some positive comments. Secondly, I will point out where I think Mahoney missed a couple of valuable opportunities apologetically, historically and archaeologically. Yesterday I posted an article titled Navigating “Patterns of Evidence for the Biblical Exodus which essentially outlined where the film would focus most of its attention. That focus was on the dating of the Exodus or the chronology (or when it happened), and that was correct. More on this in a moment, but first some positive observations of the film. One of the first things that impressed me about the film was its very high production quality. It had the feel of a National Geographic special. Throughout the film there was extensive use of computer graphics and 3D animation which was very helpful. 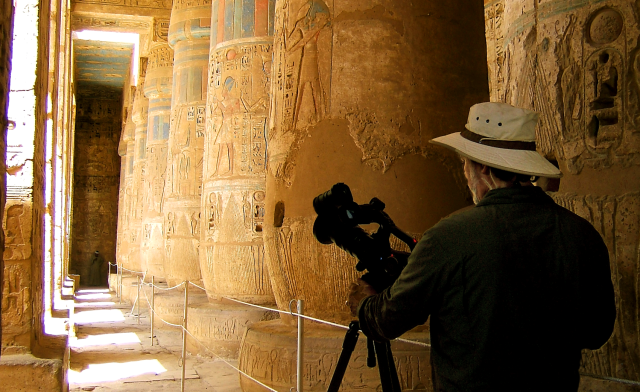 In addition, Mahoney traveled to some amazing places in Egypt (Luxor), Israel and Europe to shoot the interviews. The shots were well crafted and well edited. The cinematography was top rate. The next thing might seem like a rather silly thing to comment on, but I think that it is also an important part of any film – was the music. The film score was epic, adventurous, mysterious (in places), and just well done. The music was performed by the Budapest Film Orchestra, and the Budapest Film Choir. The film does an excellent job of putting the question of the historical exodus back on the table and in the thoughts among those in the general public, and perhaps even some scholars who are open minded. Most liberal leaning scholars and archaeologists are highly dismissive of a historical exodus (including scholars such as William Dever, Israel Finkelstein, et. al.). It was very good to see such conservative Christian scholars, such as James K. Hoffmeier, Charles Ailing, Bryant Wood & John Bimson given some air time to make the case for a historical exodus. Rarely does the general public hear a conservative give a scholarly response on a historical documentary, and some of the evidence they presented was formidable and compelling. There was some great archeological evidence that WAS presented. Much of it was amazing! The Argument: Which date/time? Which Pharaoh? I’ve seen and heard some of my fellow apologists lament the fact that Mahoney didn’t cover questions like the route of the Exodus or how many Hebrew slaves came out of Egypt. I’m not saying that these are not important questions, they certainly are, but they really don’t help us pinpoint the Exodus in the historical record. Perhaps he may explore these questions in a future documentary. As I stated in my earlier blog on the film, the focus of attention was on the dating of the Exodus. This is where things got a little fuzzy for me, and I suspect the viewers as well. Essentially three main dating options were presented in the film. The reasoning and the evidence for each dating option, however, was not clearly explained. In my view, that was really the crux of the matter. That is what people came to see and wanted to know. It’s one thing to state that the historical exodus might have around two hundred years earlier (say, around 1450 B.C. ), but it is quite another thing to give the reasoning as to why this was the case. This wasn’t made clear, and it certainly could have been. The documentary did a good job of explaining the different views and opinions that scholars have on the biblical Exodus. But, as I’ve pointed out earlier it was unclear if any clear and defninitive answer was arrived at for when the Exodus actually occurred. The problem is that the evidence that was presented as supporting the Exodus was conflicting. My concern is that Christians may walk away from the film being even more agnostic about the Exodus than certain that it happened. But perhaps that was Mahoney’s point. We do have evidence for the historical Exodus, but there is not a consensus among conservative scholars on the exact nature of that evidence and which evidence is most reliable for defending a historical Exodus. Christians should consider the evidence for themselves and decide. I did not, however, like the fact that Rohl and his revised Egyptian chronology, seemed to play a central role in Mahoney’s film, which is unfortunate. The reason why that is unfortunate, is that there are better arguments for the Exodus which Mahoney did not give proper credit to. I’ve known about, and been intrigued by the work of David Rohl for quite some time. I first heard about Rohl’s work when I read a review of his book, Pharaohs and Kings: A Biblical Quest (originally published in the UK as A Test of Time: The Bible from Myth to History) some years ago. I now have the book and have read Rohl’s arguments for revising Egyptian chronology. In the film Rohl states that the Egyptian chronology and history is in need of major revision (shifted two centuries!). Rohl’s main argument centers on the uncertainty surrounding Egypt’s Third Intermediate Period (called a “dark age” in the film). The ancient Egyptians kept a pretty good records of their kings. In addition to temple ruins and palace walls in Egypt, we also historical sources for Egyptian history. The work (Aegyptiaca, or “History of Egypt”) by an Egyptian priest named Manetho who served under Ptolemy Philadelphius 285-246 B.C., survives in fragments in (Jewish Antiquities) Flavius Josephus (First Cent. A.D.), Africanus (A.D. c. 221), and G. Syncellus (A.D. c.800). Manetho gives a fairly accurate account of Egyptian history, although there are some obvious gaps in it. In ancient Egyptian history, are three “Intermediate Periods” in which foreign rulers (i.e. or non-Egyptians) would rule over Egypt. The third intermediate period begins in 1070 B.C. and ends in 664 B.C. with the expulsion of the Nubian dynasty under Psamtik I – a time span covering approximately 406 years! To complicate things – much of the history of other nations in the Ancient Near East (Phoenicia, Assyria, Babylonia, Palestine, Canaan etc..) is LINKED to Egyptian history. So, if the dates assigned to Egyptian history and chronology are off, then consequently, so are the dates of these other nations. Rohl is certainly correct to point out that Egyptian history is in need of revision. But the question at hand is, HOW MUCH is it off? And what reasons does he give for adjusting the Egyptian chronology 200 years? In the film we don’t get a clear answer, but Rohl’s book provides one. In Chapter Six of the book titled “Towards a New Chronology” Rohl gives his main argument, which stems from a genealogy of Egypt’s Royal Architects discovered in Wadi Hammamat. The Genealogy of the Royal Architects, discovered in the Wadi Hammamat, confirms that the era known as the TIP (Third Intermediate Period) has been overstretched. Furthermore, all three key genealogies linking back to the New Kingdom indicate that over a century must be removed from the chronology of the transition period between the late 19th Dynasty and the Third Intermediate Period. A revised Egyptian chronology would directly affect the dating of the Bronze and Early Iron Ages in Palestine since the dating of those periods is dependent upon synchronisms with Egyptian history. Biblical chronology, on the other hand, remains unchanged since it is derived from synchronisms with Assyria in the Divided Kingdom period and then calculated backwards using the internal chronological data of the Bible. For further information and a more in-depth critique of Rohl’s Revised Egyptian Chronology see Wood’s entire article here. As I’ve admitted in my previous article, I believe that the evidence and arguments put forth for the early date (1446 B.C. ), as articulated by Dr. Bryant Wood make the most sense and solve the most problems for reconciling the biblical Exodus and the archaeological and historical record. For those interested here are three articles which may be of interest. I only wish that Mahoney had allowed Dr. Bryant Wood & Dr. Ailing more time to lay out the case for the early Exodus-Conquest model which is based on good archaeology and good scholarship. My complaints, notwithstanding, I think the film was excellent and worth seeing again. I would even use it in my seminary class on Biblical Archaeology to show the different views which one might have on the Exodus. I would encourage others, who were not able to see the film on the release date, to watch it and purchase the DVD when it comes out. Perhaps on a future episode Mahoney will explore these questions further. I commend Tim on an excellent film which explores a subject and story that is very near and dear to my heart. The Christian community owes Mahoney a huge thanks for bringing such a vitally important event in biblical history in the spotlight, and he did it with excellence! When you get a chance – go see it! David Rohl, Pharaohs and Kings: A Biblical Quest (New York: Crown Publishers, 1995, pg. 143.